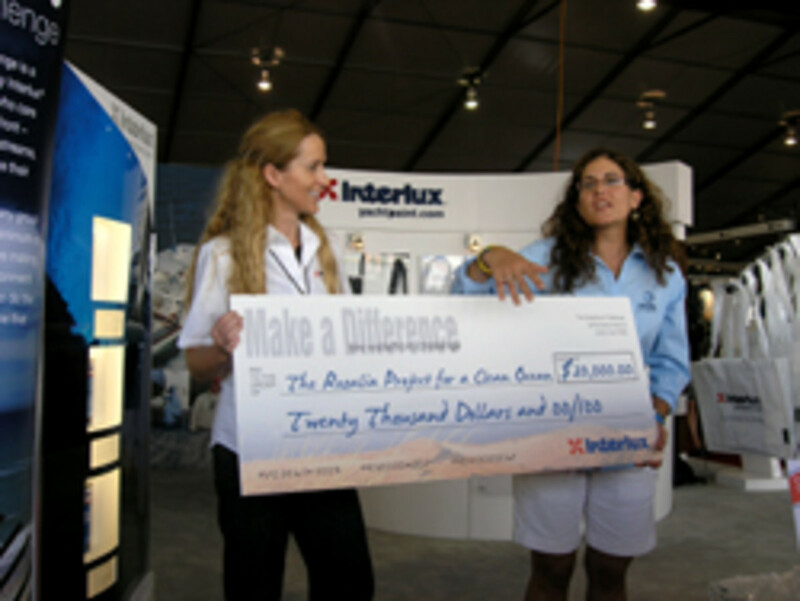 FORT LAUDERDALE — In a ceremony held Friday at the Fort Lauderdale International Boat Show, the Rozalia Project for a Clean Ocean received a $20,000 check from Interlux as the national winner of the 2011 Interlux Waterfront Challenge. Five other organizations also received checks of $4,500 each as the regional winners of the 2011 Waterfront Challenge for creating sustainable waterfront environmental improvements in their communities. The Vermont-based Rozalia Project used a state-of-the-art remote-operated underwater vehicle to help nearly 1,400 people remove more than 4,400 pieces of marine debris from the sea floor in eight New England locations. “We’re incredibly thrilled to receive this generous award from Interlux,” said Rachael Miller, who co-founded the Rozalia Project with her husband, James Lyne. “The funds will enable Rozalia Project to keep pushing forward with cleaning up our oceans and waterways from the surface to the sea floor, inspiring people of all ages to be part of the solution and learning more about the problem of marine debris in order to discover ways to reduce and reverse its effects,” Miller added. The judges for the 2011 Interlux Waterfront Challenge were Thom Dammrich, president of the National Marine Manufacturers Association; Fred Daoust, general manager, Interlux North America; John Kelly, chairman of the American Coatings Association Antifouling Working Group and a member of the California State Lands Commission Fouling Technical Advisory Group; Dan Pingaro, CEO of Sailors for the Sea; and Susan Shingledecker, director of environmental programs for the BoatUS Foundation for Boating Safety & Clean Water. More than 5,000 boaters also helped the judges choose the regional award winners by voting for their favorite project at the Interlux Waterfront Challenge page on Facebook.